Flare Energy Services offers portable surface equipment manned by professional crews enabling around the clock well monitoring. We use 3-phase separators, sand separators, choke manifolds and all necessary lines and fittings to test the oil, gas, and water production and to remove fluids and solids from the stream in order to make a well productive as quickly as possible. These testing methods enable us to provide our clients with the amount of oil, natural gas and/or gas lift, and production of the well(s). Flare uses both satellite communications systems and cellular communications. We are available 24 hours a day. Flare is available via phone 24 hours a day and has the ability to have crews onsite 24 hours a day for anything the client may need. Each site has its own computerized reporting system for creating each clients customized production reports. 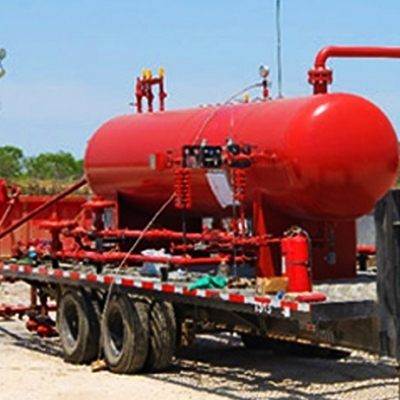 Our refined Well Testing process is the most cost effective alternative to flaring/venting into the atmosphere. It’s our policy to manage & conduct operations in a manner that offers complete protection to any and all involved. With real-time information our clients can actively review & analyize this info to maintain or enhance production of the wellbore. 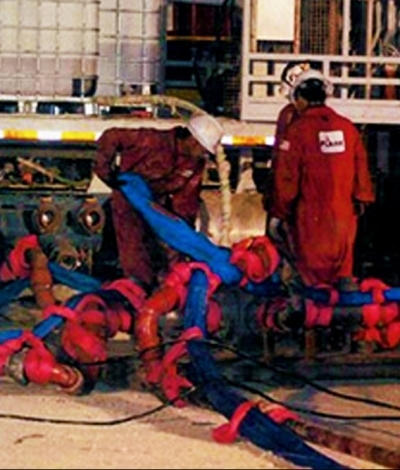 Flare’s Flowline Safety Restraint System saves lives and needs to be an integral part of any high pressure fluid operation. Flare’s high strength synthetic restraints dissipate the dynamic force released during a rupture minimizing the “lethal zone”. The flowline is connected in intervals to a load bearing line that is laid out next to the flowline, and anchored to secured points. Our refined Flowline Restraint System provides peace of mind knowing your people, property, and livelihood are in good hands. Safety Restraints run not only from the pressure trucks to the well head, but from the wellhead to the diffuser during fluid recovery.